Want a shirt that gets you noticed? This is my latest Siena Shirt [pattern by Linda Lee from The Sewing Workshop] made with two fun and colorful aboriginal 100% cotton fabrics from M&S Textiles Australia. cotton fabrics by M&S Textiles Australia. 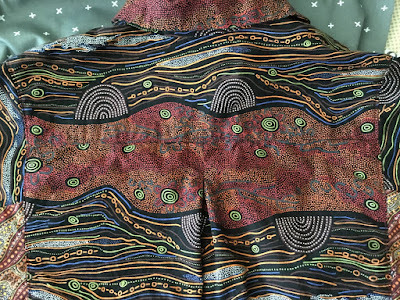 The main fabric in this shirt is an aboriginal design called Sandy Creek from M&S Textiles Australia. 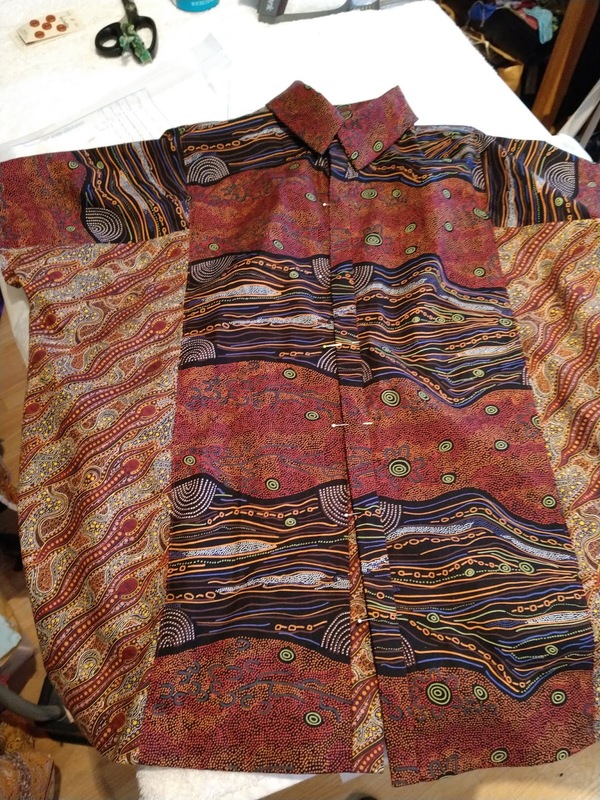 This print has wide stripes running with the crosswise grain of the fabric (perpendicular to the selvedge). Sandy Creek design with a wide stripe. To make the garment look cohesive, conscious decisions were made when positioning the pattern pieces on the yardage. First, I needed to determine where the stripe would lay on the body so I could then "fussy cut" (as quilters would call it) the pattern pieces. Matching stripes across the front of the shirt. The pattern pieces were cut so the stripes matched across the front. The stripes aligned from front to back of the shirt and between the back bodice and the back yoke. 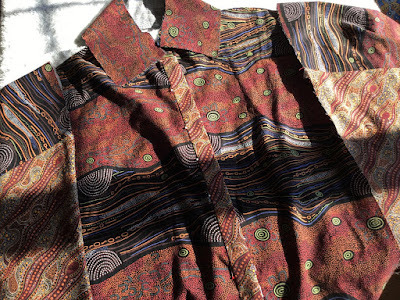 The front button band was carefully fussy cut to preserve the flow of the design across the shirt's front. Back yoke and pleated back bodice. 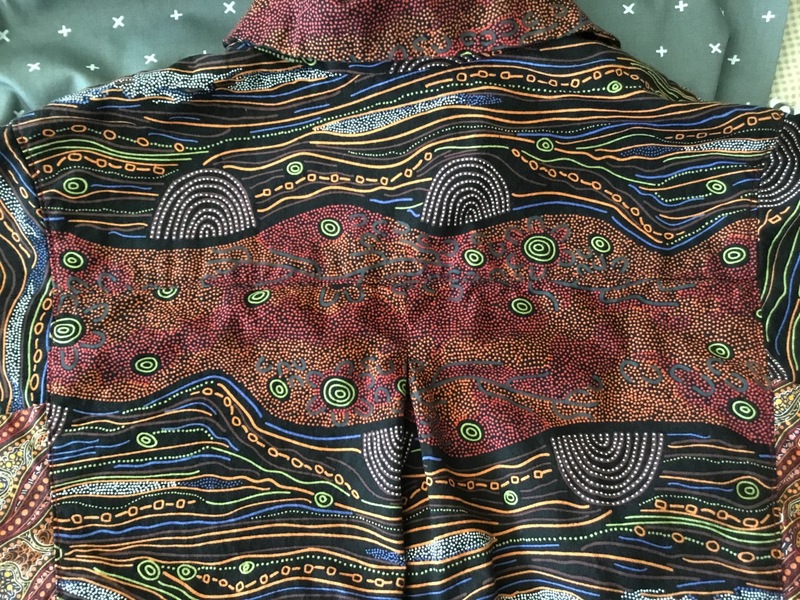 Another "fussy cut" was on the sleeves so the darker part of the "creek" design would carry through across the shoulders. Construction in progress: collar, fronts and sleeves laid out. The upper and lower collars were cut from two different areas of the print. Depending on whether the collar is worn up or down, the design will blend or contrast with the yoke and front. 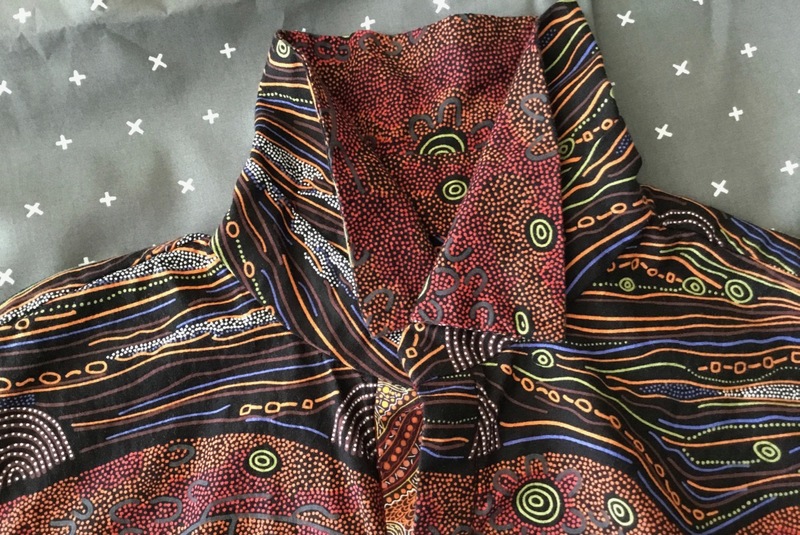 Upper and lower collars show contrasting prints. A coordinating fabric—Spirit Dreaming from M&S Textiles Australia—was used for the sides and one front band of the shirt. Contrasting sides and front band. 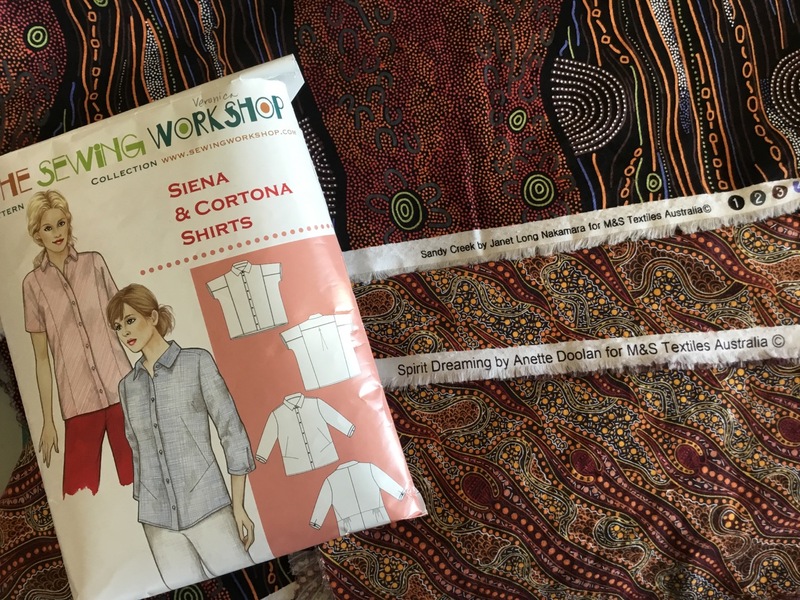 The M&S Textiles Australia fabrics lend themselves quite nicely to garment sewing. These cottons have a soft surface quality, good drape and are breathable. 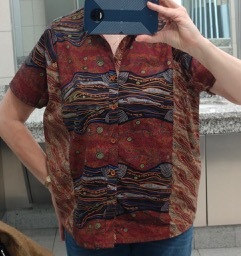 I completed the shirt and was able to wear it at Quilt Market. It received several compliments. Siena Shirt pattern and Australian aboriginal fabrics. 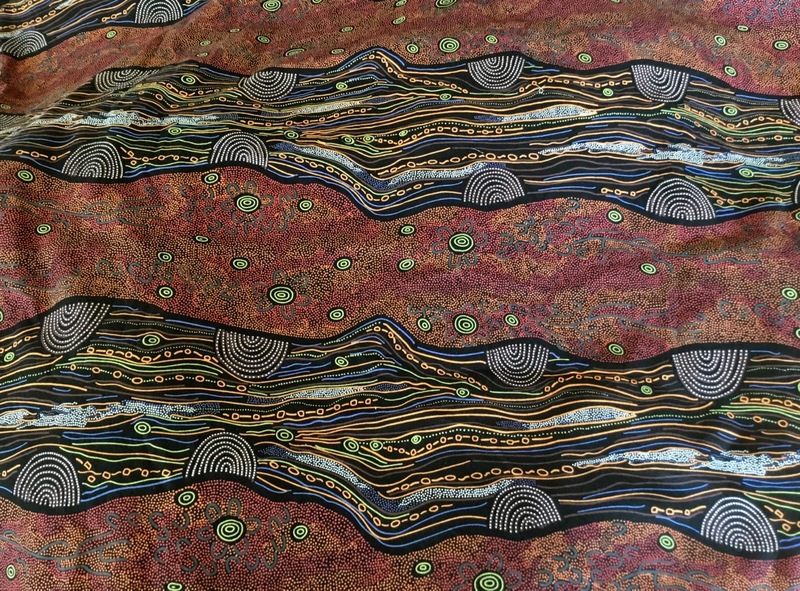 When considering fabrics with specific or directional motifs—such as the stripes in this Sandy Creek print—I would recommend purchasing a little more fabric than the pattern calls for. This would allow flexibility to position pattern pieces, fussy cut the motifs, and match motifs as needed. 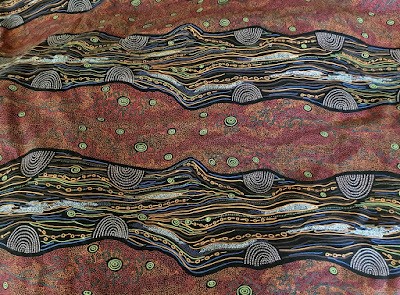 Sandy Creek and Spirit Dreaming fabrics from M&S Textiles Australia. 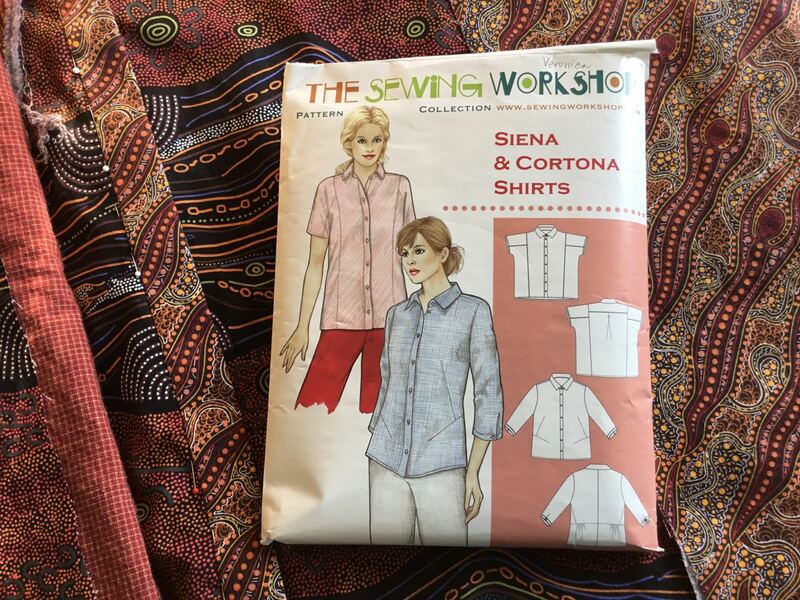 Give the Siena Shirt and Australian aboriginal fabrics a try. A little extra thought and time in the cutting will yield great results... and some well-deserved compliments.